"Honesty is a step toward greatness." 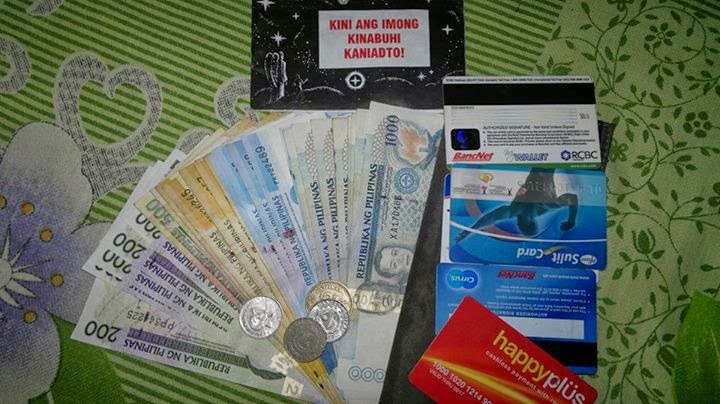 An honest working student in Davao returned to its owner a wallet full of cash he found at the airport. Raphael Joshua Mira, who uses the name Raph Josh Mira on Facebook, found the wallet of Romulo Coste, a resident of Panabo City in the province of Davao del Norte, Philippines. Raph just came from Pasay City in Manila, where he attended the wake and burial of his mother who died recently, when he found the wallet at the Davao airport. From the looks of the items in the photo Raph posted, the wallet contained more or less P15,000 cash and several ATM and business membership cards. According to him, the owner was traced by RCBC Tagum branch with the assistance of the city police. He said the bank conducted strict procedures to verify the identity of Coste, who was set to claim his personal properties on Wednesday, December 3. Raph, who said he was amused that the 56-year-old uses a Penshoppe wallet for teens, admitted that he did not receive any reward, saying he doesn't need anything in return for a little favor. Due to financial constraints, the honest working student planned to stop schooling after this semester, but he is determined to finish college in the future. "Despite sa lahat ng nangyari sa buhay ko, I still have reasons to go on and continue what education brings ahead of me. Saying 'thank you' is not enough but I sincerely saying the words, 'Thank you' from the bottom of my heart," he said in a post. "I promise to keep looking ahead and aim for brighter future." Raph's only wish for Christmas is to meet Davao City mayor Rody Duterte and shake hands with him.